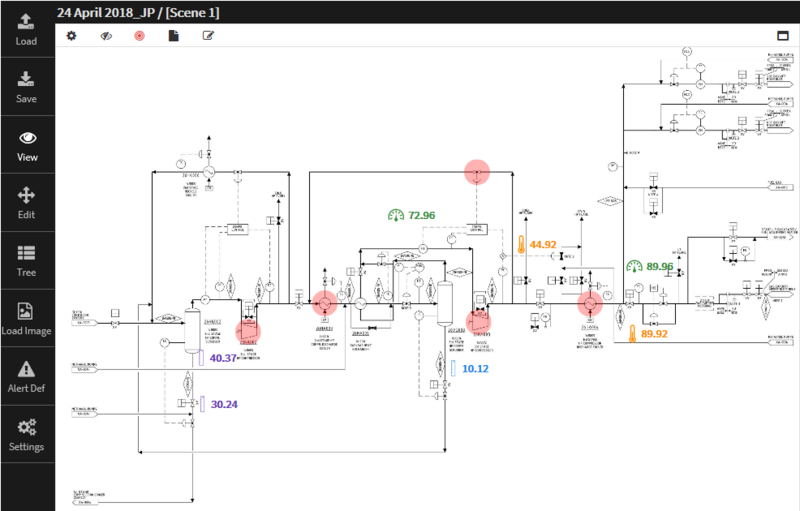 GOA is a production efficiency tool that animates existing plant construction drawings (P&IDs, PFDs, hook-ups, etc. 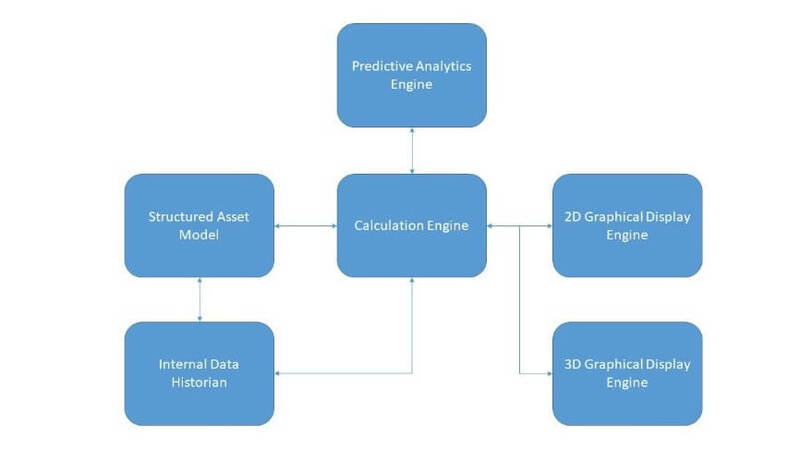 ), fully integrates them with 3D plant models and employs predictive analytics to improve performance and avoid shutdowns. The core of the system is a structured plant asset model, which can be built largely from an existing plant historian or control system configuration. GOA replicates live plant data into an internal data historian and all calculations and analytics operate on this internal data so that there is no possible impact on the plant’s existing data systems. 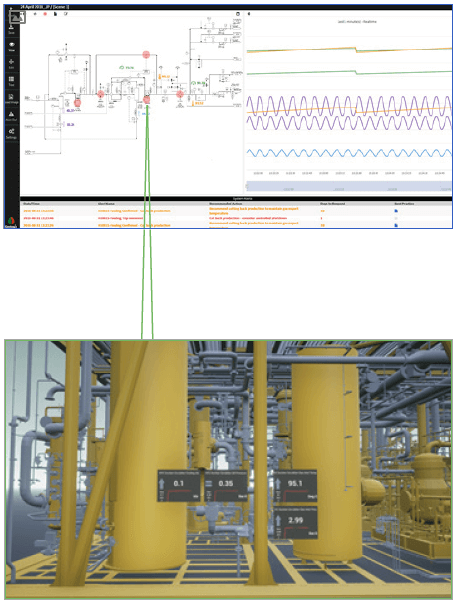 The 2D Graphical Display Engine enables the user to animate existing drawings with live and historical plant data so that there is no requirement for re-drawing any of these. The drawing to the left shows an example PFD that has been animated. The use of existing configuration data and drawings is unique and avoids major work required to re-build. 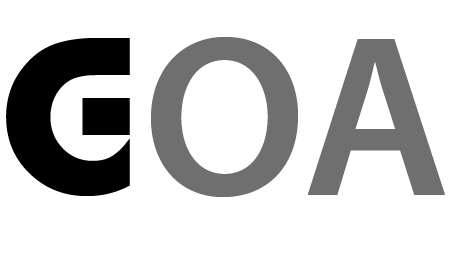 GOA contains a full trending and alerting capability which is driven by the Calculation and Predictive Analytics Engines. The diagram to the right shows the same PFD with associated trends on the right-had side and operational alerts at the bottom. The alerts are not the same as DCS alarms but are notifications that plant performance is declining. Recommended corrective actions, authored by the asset teams themselves, are presented along with an indication of priority and urgency. The red dots on the PFD are configured “hot spots”, which allow the operator to switch to 3D visualisation mode, a very important feature for personnel that are less familiar with the plant layout. Clicking on a hotspot will teleport the user to the actual location in the 3D plant model, where live and historical data and trends are available also.